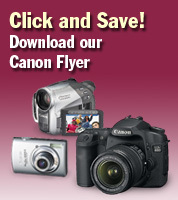 If you live in the Ridge Meadows area, check out The News newspaper today for your Canon flyer from Photo Express. Please note that a lot of the prices are actually high in the flyer, due to price drops from the strong Canadian dollar. For up-to-date pricing, check out the flyer online.